Prints- A few new pieces were done this year. Completed an in-progress supermarket print, the latest in that ongoing series. Started and finished a new saint, a request for a young relative. My carving skills were put to a new task this year, which I'll talk about later. And of course a new holiday card was carved and printed- the coloring and writing out of those cards will have to wait until I get my grades done. Have ideas for more prints, but again those will have to wait just a little bit. Shows- Kept busy with lots of local shows, many of which were dropped in my lap. 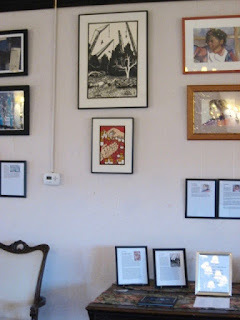 Had about a dozen works up on walls this year, several carrying over from last year's show at OCC, which ended up extending into this spring-likely because the space had nothing else to replace it with. 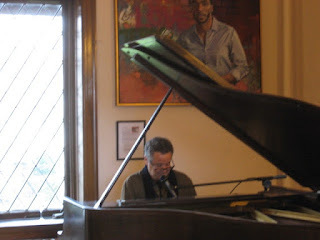 Participated in a few shows in Belmar, and some that were related to my connections there, such as a corporate space in Wall, and two in Spring Lake, such as the current invitational "Activist" show we have there right now. Was part of a new show in Ocean Grove that happened at the same time as the passing of the building's founder, so we'll see what the future holds. 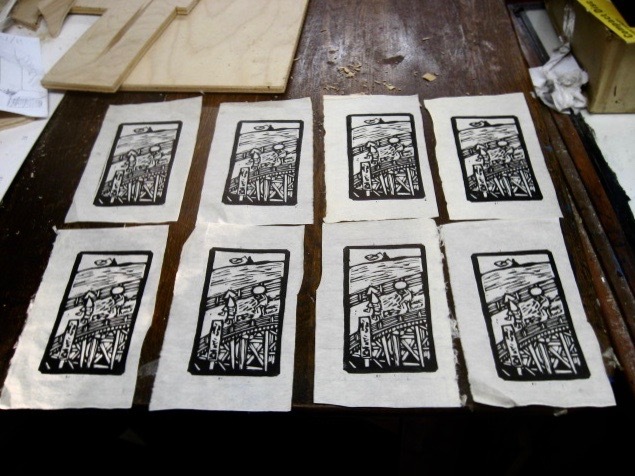 Teaching- Had the first Belmar print workshop in a few years- demand for woodcut finally built enough to get it on the scheduled and filled, with 6 students. The organization is impressed and seems to want more, but it's really up to the demand. There is so little woodcut being taught these days, that if you are in New Jersey and want to learn woodcut, you are probably coming to me. Firsts- Early in the year I showed my first etching in many years, mostly because it suited the theme of a show and was already framed. Haven't done a new etching since the 90's, so I don't think this will happen too often. Over the past several months I have been working on a wooden sculpture, putting my skills and tools to a new use. As a kid I carved with pocket knives and was able to do a few things- now I have more skills and better tools. This one is a specific request so I don't know if there will be any more, but it's good to know I can do it. One of my former local students has so fallen in love with woodcut that she's organizing a bi-coastal print making show, scheduled for this fall. I'm letting her do most of the work, but I'll advise and contribute a piece when the time comes. Studio- Still haven't got confirmation that Molly renewed our lease. If she does, then I have plenty of things to do. 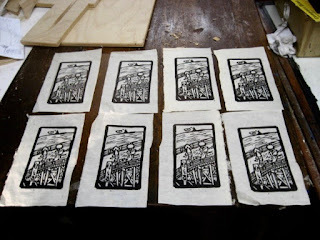 If not, I can do what I do almost anywhere- such is the advantage of woodcut. When I know more I'll post it here. See you next year. I reached my goal of having a prototype of my card done in time for Christmas, which I was able to photograph for this blog, and even had one to give out. However, I still owe cards to several more people, so that meant going back into production again. Several days ago I attempted to print 7 copies of the new card, all on the type of paper I typically use for the cards, but only two of those worked out. With the rest, the stiff paper shifted, the ink smeared, and other things that made the results unusable. Afterwards, I thought about how I could solve that problem. I came up with a new idea- print the block on thin Japanese paper, color them, then mount the images on to card stock. Printing would definitely be easier, we'll see how the rest works out. I had remnants of two sheets of Okawara student grade paper, big enough to be divided into 8 small pieces large enough to print the block. I brought those to the Studio, cut them down to size, got out the ink, and went to work. Not surprisingly, the printing went very easy. I completed the printing of the above 8 prints in less than half an hour. Eight card covers, with no smears, torn holes, or other problems. After cleaning up I brought them home with me to dry for a few days before I begin the next step. I used this same paper to print my boardwalk prints, so I know that if I am careful, I can color it. I need to think about my mounting strategy, but that is still days away. But not too far, as I hope to send out some more early in the new year. I had been keeping the design of this year's card under wraps, as is my custom each year, but now Christmas time has arrived and people can see it. 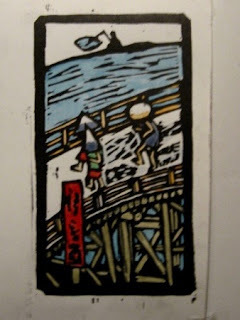 It's based on a well-known woodcut by the Japanese artist Hiroshige, of the ukiyo-e era. This is a detail of the original print, as mine is only about 6" x 4", to fit in a small envelope. I had been able to print two readable copies, so colored both last night in preparation for today. I typically add winter and holiday bits to the images I adapt, so in this case it's snow on the bridge and on the umbrellas, and a person who had been on some kind of boat is now ice fishing, but otherwise it's about the same. Only 7 different colors, so that didn't take too long. The above photo is a little dark, so I may try again tomorrow. I will try to produce an edition in a few days, so I can have some to distribute to people who have earned them. Back to the Studio today to continue work on the cards. Had a few ink knives this time, so I was confident of getting some ink from the can to work with. 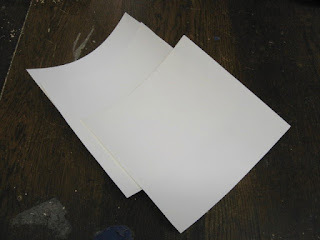 I had three pieces of paper the correct size, bristol board left over from my 3D class, where we used it in some constructions as part of different projects at both colleges I had taught it. Bristol board is a relatively stiff paper, which gives it the strength to function almost three dimensionally, and I have used heavy stiff papers for my cards because I want them to feel like standard commercial greeting cards. I'm sure there are differences between different brands and types, and I have no idea who manufactured the sheet I cut up. The pieces still had a hint of the curve from being rolled up the day before. Stiff and somewhat slick. Got out a small pile of ink, and worked it with the knife to warm it up a bit. The block rolled up nicely, showing all the detail I had carved yesterday. Tried printing the first one, but not so good- the paper shifted on the small block. The second piece did the same, as did the third piece. Cut another chunk into three more pieces, plus added a previously cut piece of paper from another year. Fourth attempt still not good. Fifth attempt was still not usable. Each time what was happening was in the vigorous process of hand rubbing the block, the paper would shift slightly, resulting in a double printing, smearing, or other such problems, making the unsuitable for cards. 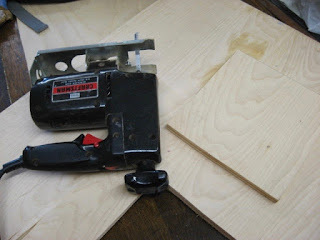 Small piece of paper, small block of wood, very little space to hold it in place. Softer and/or thinner paper would print much easier, but wouldn't work as a card, and in any case, this was the only paper I had with me today. My best solution was to use push pins to anchor the other side of the card to the wood block and then to start the process of hand rubbing. And it seemed to work. At the end of the session I had two usable prints of the card from image. Cleaned up my mess, and brought all the cards home. The blurry versions I will use to experiment with colors (brought my watercolors home, too) and two good ones that can serve as the one that I photograph for the blog in a few days. After I am done with school tomorrow, I can think about paper options. Have other print papers left over from my summer class- maybe one will work. Back to the Studio today to continue work on this year's holiday card. I looked over the drawing I had done last night and decided the concept was good. Just adjusted a few details, then got out some cutting tools and got to work. Working at my regular table, cutting progressed quickly, the whole block cut in about 1.5 hours. I had thought about going ahead and pulling a few proofs right then, and went so far as to cut a few pieces of bristol board (the type of paper I'll be using to make the cards) to the right size. Unfortunately, none of the bags I had with me seemed to contain an ink knife, which is essentially a putty knife, used to extract printing ink from cans. Must have them in some other bag(s), a problem that can happen when you work and teach in multiple locations. So that will have to wait until tomorrow. Probably just as well, as I had three more tasks in different locations I had to take care of before 5 pm and time was running short. A lot going on in my world right now, and little of it to do with making new art. However, over the past few weeks I have been able to cross a lot of things of my list of things to do. The next big thing is everything to do with Christmas. Right now it's all incomplete. One thing I did today was get some more work done on this year's Holiday card. Last time I mentioned this I had created the block, then had to set it aside while I dealt with some other pressing matters, some with deadlines coming sooner than December 25th. But I had a little time I could spare today and took my block back up to the Studio. And before then I had even finally selected a subject and idea, so I had a plan for today. Unfortunately I had forgotten a book with the source artwork. Luckily I found an image of the piece in one of the books in the pile Molly has in the hallway outside our space. 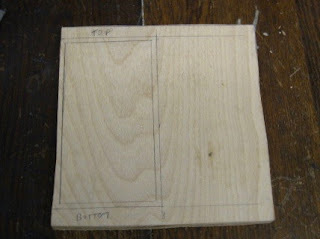 I started by laying out the plan for the block, shown above. And since it is my custom to keep the card under wraps until Christmas, that's all I'll be showing here for several days. However I did sketch it all out on paper while I was there, and later at home, sketched it in pencil on the woodblock, so it will be ready for me to start cutting next time I get there. Luckily I already have ink, paper, tools, and watercolors. Time is the one tricky thing right now, but I think I'm on track to have a prototype ready to show here on Christmas Day. As for when copies get out to people on my list, lets hope before January. It sneaks up fast every year, but it looks like Christmas is coming around again. Coming to the end of my semester, snow has been falling a bit over the past few days, and people are already beginning to ask about things related to my annual Christmas card. So today I went to the Studio and got work started on the card. By which I mean I did the first step in creating a new card- I cut a piece of wood for the block. I have no idea what the card will be yet, but it can't be anything without a piece of wood to cut, and now I got that part done. Brought it home, as whatever it turns into, I can do that drawing from home. I haven't been given a deadline to finish this mermaid, but I do find myself wanting to get it done. I put on the last layer of colored ink fairly thick. Two weeks later, still not quite dry, not what I expected from a water soluble ink. 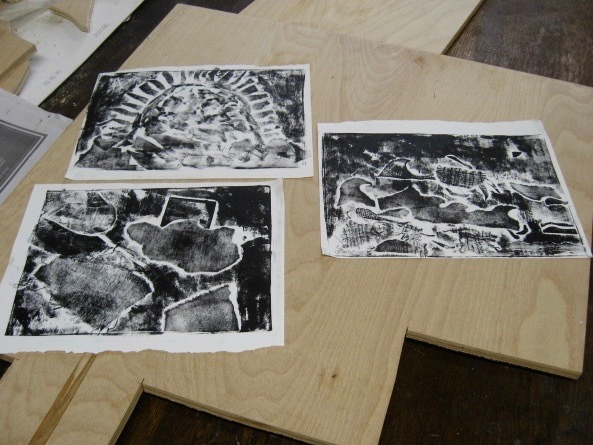 The thin layer that is transferred from wood block to paper in the printing process is usually dry in an hour or so, but this time I was applying it to cover the wood, and to work down into the carved areas. When I was in the Studio yesterday I checked it again and decided it was good enough, at least the areas where I needed to add the next layer of color. 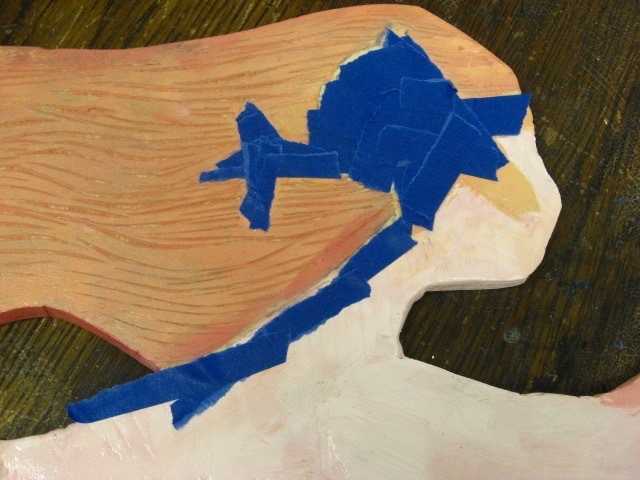 The next two areas to be done would involve carved textures with a first layer of color already on the wood. I'd be taking advantage of that existing texture and using a brayer to apply the color just to the top of that carved wood. First I took on the hair. The design I had been given included two starfish and a sand dollar on top of the mermaid's hair. I carved the block to keep the sea life at the highest level, with skin and layers of hair at a lower level. Previously I had applied a darker colored hair (a deep orange color) all over that part using a brush to work the color into all the cut areas. Since the plan was to use a hard brayer to apply the highlight hair color over the top, I had taken a print of the starfish area on a piece of copy paper, and planned to cut it out to use as a stencil mask. Unfortunately I left that paper in something else I had not brought with me today. I started going to the trouble of creating a new stencil mask, not so easy now that the ink in that area was mostly dry. Then I realized I had an easier solution- a roll of blue painter's tape in the drawer of my printing station. Tore it into small pieces and stuck them all over the areas to be protected from the new color. Mixed up a new highlight color, and used a hard brayer to roll it all over the hair, while the tape kept it from getting on the small sea creatures. No special efforts needed to do the tail- just a blue-green color that could be rolled onto the original surface and not getting down into the carved deep blue areas. I removed the blue tape, squeezed out a little bit of titanium white, and used a brush to color the sand dollar in her hair and her scallop shell bikini top. Results are shown below. Still not quite done, but close. I think I want to create a darker color for the starfish, so they visually separate more from her skin and hair. 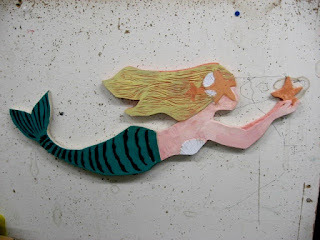 And I will color the half inch edge of the wood around the tail with more of that blue green color, and there may be a spot or two to touch up with the brush, but all that will have to wait until the ink has time to dry. In a perfect world I'd spend a lot of time in the Studio making cool prints, but in the real world I have to devote much time to making a living. I did get to the Studio today, but the time was devoted to my teaching job. Still, I always try to slip at least one print project into each class, since most college students don't get many printmaking opportunities these days. My 2D classes always do a woodcut, and my drawing classes (time permitting) will do a day of monotypes. For my Intro class, they get to try some collographs. Requires the least amount of art skill (a non-majors only class, after all), but good results are within reach of everybody. And a lot of the materials we use are cast off stuff I used to pick up around the building, though with the design department being moved from building to building the past few years, my supplies are starting to dwindle. The emphasis is on range of textures. It's a portfolio exercise, so technically not due until the last day of the semester, but I only bring in all my printing stuff one time, so students who miss that day are invited to bring me the finished plates and I take them home to print. More work for me, but I do love prints and I will make an effort to expose them. It's pretty much new to them, and often it's the one artwork the students keep before throwing away the graded work, so maybe it's worth it. So today was the day to print, so I grabbed my collograph printing bag as part of my Studio visit. The above prints are the ones pulled today, and I'll return them to the students this week. I also used the time to grade some large messy pastel pieces turned in last week, but that's for a different blog. The week before last I updated my statements and delivered a few pieces to the gallery. Last week I stopped by to pick up the postcards for the show and passed out a few. Today was the opening reception, officially making me an activist. So early this morning I rolled out of bed and down the hill into Spring Lake, and several blocks later I was at the Community House. Plenty of street parking that time of day. I went in the theater side, and while there was no one in the lobby, I did hear voices coming from beyond the back doorway. In the space that is known as the Brown Room I saw the usual crowd and some refreshments. Said a quick hello to a few people, then decided to go upstairs to see the show in the Upper Gallery. 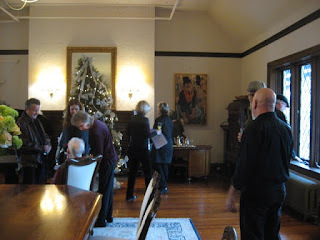 There are two short staircases with a landing between them (someone referred to them as the "servant stairs") behind the reception room that lead up to the top floor, and those took me to the gallery. There were only two other people in there with me, with everyone else still downstairs at the refreshments. Made a quick circuit of the room, and then found my stuff on the large wall near where I came in, with my two statements in table frames below them, as shown below. With no action upstairs, I decided to go down and join the crowd in the refreshment area. There were some mini-muffins, little quiche appetizers, cookies, fruit, brownies, etc. 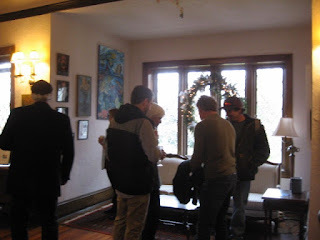 I knew most of the participating artists already, many from BelmarArts, so most of the conversation was that of people who already knew each other and what our art was about. The person I ended up talking to the most was Maxine King, who was the person there I've known the longest, going back to our years active in the Printmaking Council of New Jersey, well before she started doing things in Belmar. So we were commiserating over the end of that earlier organization, which had been drifting away from anything printmaking for years before officially merging this year with another organization that has no use for printmaking. Sad, but much of what I was doing there I now do in Belmar, and it's a lot closer to where I live. At one point is was announced we should start moving upstairs, so we gradually made out way up to the gallery, giving the space a more expected look. Not as crowded as the last show I was a part of in this space (which had over 60 participants), and having the reception on a chilly dreary Sunday morning certainly didn't help us get a crowd. It seemed that people came and went, and I estimate about 35 or so present most of the time. The thing that lured all of us upstairs was that one of the 21 participants in the show was not a visual artist, but rather a musical artist, and he was going to go a short performance. However, it fit in very well with the theme of the exhibition. Tim McCorry was one of the founding members of BelmarArts, but we haven't seen as much of him lately (though he did have an interesting outfit for our Mad Hatter's Tea Party earlier this year), probably because a lot of his time has been devoted to a new project- the creation of a Broadway musical. It's called Coyote the Musical and it's about human smuggling across the border and a lot of related issues and concerns. It turns out that getting a musical off the ground is quite a slog, and he has spent years writing songs, staging readings, raising money, etc. He first played songs for us at the Boatworks years ago, but tells me the process is still working toward the goal. The reception was scheduled to end around noon, and I departed shortly before then to take care of some errands and get on with my busy day. The Artists/ACTIVISTS show remains on display though March 30. 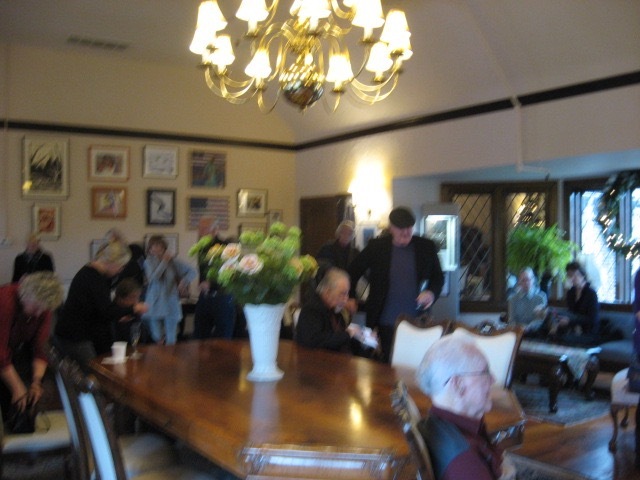 2018 at the Spring Lake Community House, 300 Madison Avenue there in town, officially listed as open noon to 3pm Monday to Saturday, and during theater performances, but I have found the doors unlocked at other times, so you can always go and take your chances.